A' Design Award and Competition - What is it Worth? What is the worth of winning A' Design Award? Enter A’ Design Award to have a chance to win rewards sum worth up to 50.000,00 € and more, the rewards will be offered to winners only, and the rewards consists of advertisement, public relations and certification services. Enter to A' Design Award to win awards valued up to 50.000,00 €. Read More below. To have an idea about how much a winner actually costs for us, click here. Win € 25.000,00 Worth of Equivalent Advertising Value by Following the Winners' Manual Suggestions. Win € 7.500,00 Net Google Adwords & Facebook Advertising at A' Award. ** In addition to Others. Win € 5.000,00 Worth of PR Services from DesignPRWire at A' Award, Advertising your winning design. Win € 4.000,00 Worth of Physical Exhibition Service by Mood. Win € 1.000,00 Worth of Design Mediation Service from DesignMediators. Win € 1.000,00 Worth of 1 Year Subscription to Salone del Designer. Win € 500,00 Worth of Yearbook Page Design and Implementation at A' Design Award. Win € 500,00 Worth of 1 Year Subscription to DesignMegaStore. 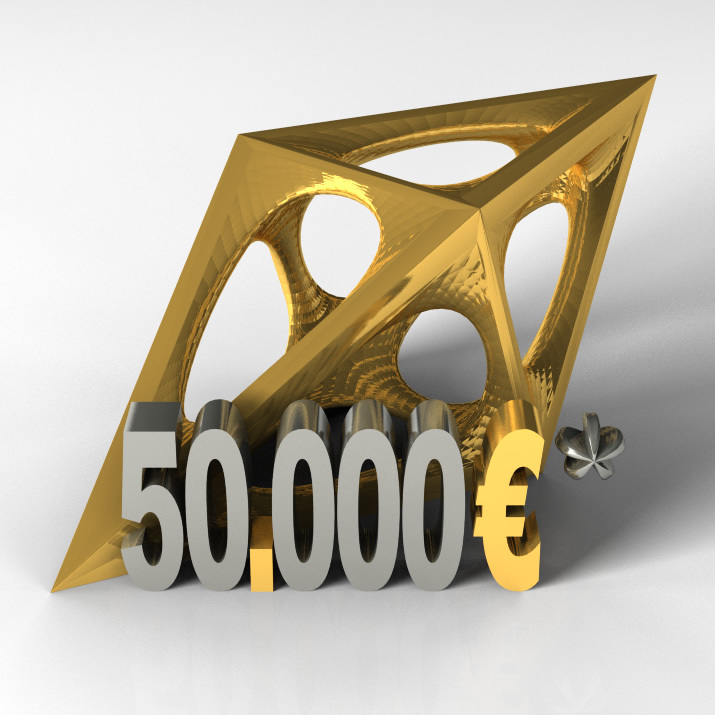 Win € 500,00 Worth of Gala-Night Invitation from A' Design Award. Win € 500,00 Worth of Editorial Article at DesignAmid Magazine. Win € 250,00 Worth of Inclusion in DesignerRankings. Win € 100,00 Worth of "Proof of Creation" from DesignCreation. Win € 100,00 Worth Physical Components of Winners Package. The rewards are for winner designs only and cannot be exchanged for monetary prizes, will be given in form of services. 1 Winners’ Manual is distributed to all winners. It is not the yearbook, it is a special document prepared by A’ Design Award in collaboration with DesignPRWire. The document discusses the best-practices for communicating your design, how to reach and pitch press members, how to advertise your award winning design with simple tools and more. For further information and a case-study click here. 2 Google Adwords Credits & Facebook Advertising Credits will be spent by A’ Design Award to promote your Ultimate A’ Award winning designs page at A’ Design Award. 3 DesignPRWire will provide many public-relations and public communications services ranging from press release preparation, press release distribution, creative writing, submissions of your Award Winning Design to online and offline media, pitching editorial sections of tradition magazines, and also blogs etc. 4 ADF – Advanced Design Factory, will make a website landing page design for your Ultimate A’ Award winning project, which will be hosted by ADF. 5 Physical Exhibition Service does not cover the transportation of your designs. It covers the preparation of exhibition materials, such as your unique poster, awards etc. The allocation of exhibition space and also the advertising of exhibition are included. 6 DesignMediators provides a service to bring companies and designers together in order to help conceptual designs to be realized, providing services such as consulting for agreements in the process. 7 Salone del Designer is an online marketplace to sell concept designs to worldwide manufacturing clients. Winners can enter the fee and can choose sales terms & conditions for their Award Winning Designs through the A’ Design Awards’ Salone del Designer Module. 8 A’ Design Award will design a unique yearbook page for your Award Winning Design. You will be able to obtain both the yearbook and also a high-resolution version of this page for your own copy. 9 DesignMegaStore is an online market place to sell design goods, design services and design related products online. Winners of A’ Design Award will be able to use the DesignMegaStore fully for one year. 10 A’ Design Award will send you an invitation to our fabulous Gala-Night to receive your A’ Award Trophy. 11 DesignAmid magazine will publish a unique article about your award winning project and will also communicate it to the members of DesignAmid newsletter. 12 You will receive points for your runner-up or A’ Award winning designs and get ranked in the DesignerRankings which is seen by many visitors every day. 13 The “Proof of Creation” is a unique document, given by A' Award learn more here. 14 Physical Components of the Winners' Package is distributed free at Gala-Night and Exhibition, but must be ordered by paying the shipment delivery fee if you do not join the Gala-Night or the Exhibition. 15 Items marked ** is for Ultimate A' Design Award Winners only.